One can often be excused for thinking that Jewish practise fell to earth from Sinai fully formed, yet this is far from the case, and with Pesach around the corner, the seder is a perfect example.One of my teachers, Rabbi Daniel Goldfarb, used to say that the Pesach Hagaddah is less a book than an archaeological dig. If you go to most Israeli archaeological sites you will find that they uncover layer upon layer of building. As the earliest inhabitants moved on, the desert sands covered up the buildings and the next generation comes along and builds anew, and so on until you have a multi-layered “tel” that sometimes spans thousands of years going straight down in one place. The Haggadah is a similar work, with the Hallel psalms dating back to the earliest days of Biblical Judaism, and songs like Chad Gadya and Adir Hu unknown to Haggadot until the early Middle Ages. Familiar pieces like Mah Nishtanah are almost a quotation from the Mishnah (Pesachim 10:4) until one sees that in the Mishnah there were three (different) questions and our Haggadot have, of course, four. So, it shouldn’t be a surprise to find out that new rituals are finding their way into today’s Haggadah, and a great example of that is Miriam’s Cup. We often think of Moses as the hero of Pesach, but Miriam has a huge part in the Exodus story. She prophesied that Moses would be born, she guarded the infant Moses as he floated down the Nile, and she sang the song of victory at the Sea of Reeds, taking the women with her as they danced and played timbrels in celebration. In fact, our tradition says, “If it wasn’t for the righteousness of women of that generation we would not have been redeemed from Egypt” (Babylonian Talmud, Sotah 9b). So many people have now begun to take on the custom of placing a cup for Miriam alongside the cup for Elijah. Why not try it this year – choose a lovely goblet, or a decorative vase, fill it with water, and place it in a prominent place on the table. As Miriam’s Cup is still a new addition to the seder, its use is not fixed. Some fill Miriam’s Cup at the very beginning of the seder. Miriam, after all, appears at the very beginning of the Exodus story (watching over her brother Moses in the Nile). Starting with Miriam’s Cup is also a way of letting people know right from the beginning that your seder is going to be a fully inclusive one. Also, since Elijah’s Cup comes at the end of the seder, it is nice to use the two cups as a frame for your seder and begin with Miriam. Others fill or raise Miriam’s cup after the recitation of the Ten Plagues and before dayyenu, which carries the story of the Exodus through the crossing of the Red Sea and into the wilderness, moments during which Miriam played an important role. Others use Miriam’s Cup along with Elijah’s Cup towards the close of the seder, with Elijah representing the herald of the messiah, and Miriam, a prophet urging us to do the work to bring about redemption. Another suggestion is to close the seder by passing around Miriam’s Cup for every one to take a drink, and commit to carrying the seder’s themes with them beyond the night of the seder. You can either fill your Miriam’s Cup with water from a jug, or you can invite everyone at the table to pour some water from their drinking glasses into Miriam’s Cup. Everyone contributing water emphasizes that we each have a role in reviving the stories of women and in sustaining the Jewish people on our journey. Feel free to use any one or any combination of these ideas for incorporating Miriam’s Cup into your seder. Whichever way you choose to do it, you are connecting your seder to the generations that have come before and adding another layer to the dig. Chag Sameach. 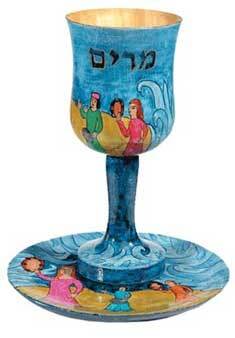 Hand-painted Miriam’s Cup by Israeli artist Yair Emanuel, illustrated with dancing women.